Ready-made recombinant monoclonal anti-idiotypic antibodies, highly specific for the humanized antibody drug bevacizumab (Avastin). 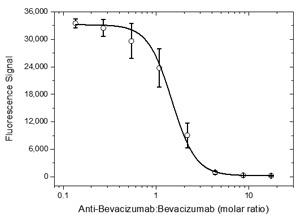 The inhibitory (Type 1) anti-bevacizumab antibodies detect free drug. These antibodies are ideal for use in direct ELISA, pharmacokinetic (PK) bridging assays and as a positive control or calibrator for immunogenicity assays to measure the anti-drug antibody (ADA) response in patient sera. 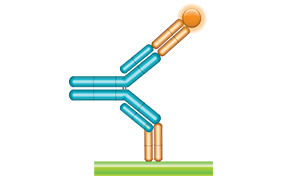 These recombinant, monoclonal, anti-idiotypic antibodies are generated using Human Combinatorial Antibody Library (HuCAL®) technology and CysDisplay®, a proprietary method of phage display, which results in highly specific and sensitive reagents, ideal for the development of bioanalytical ligand binding assays. Because these antibodies are fully human, they are also ideal as a surrogate positive control or calibrator in ADA assays when in full immunoglobulin format. 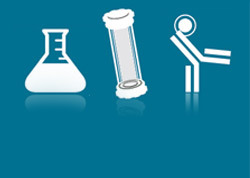 The in vitro production of recombinant antibodies results in a consistent, secure supply of these critical reagents throughout preclinical development and clinical trials. Fig. 1. PK bridging ELISA using antibodies HCA182 and HCA184P. In Figure 1, Anti-Bevacizumab Antibody clone AbD17976 (HCA182) was coated at 1 µg/ml on a microtiter plate overnight. 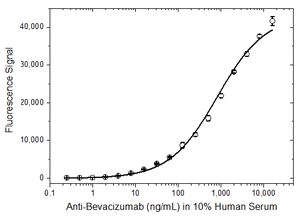 After washing and blocking with 5% BSA in PBST, bevacizumab was spiked in the given concentrations into 10% human serum. Detection was performed using HRP conjugated Anti-Bevacizumab Antibody clone AbD16748_hIgG1 (HCA184P) at a concentration of 4.0 µg/ml in HISPEC Assay Diltuent (BUF049), and QuantaBlu Fluorogenic Peroxidase Substrate. Fig. 2. Bevacizumab ADA bridging ELISA using HCA185. In Figure 2, bevacizumab was coated at 1.0 µg/ml on a microtiter plate overnight. 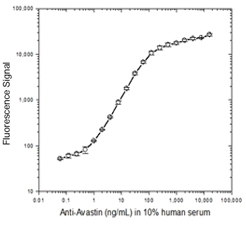 After washing and blocking with 5% BSA in PBST, Anti-Bevacizumab Antibody clone AbD17976_hIgG1 (HCA185) was spiked in the given concentrations into 10% human serum. Detection was performed by adding HRP conjugated bevacizumab at a concentration of 2.0 µg/ml in HISPEC Assay Diluent (BUF049), and QuantaBlu Fluorogenic Peroxidase Substrate. Fig. 3. Ranibizumab ADA bridging ELISA using HCA185. In Figure 3, a microtiter plate was coated overnight with ranibizumab at a concentration of 1 µg/ml. 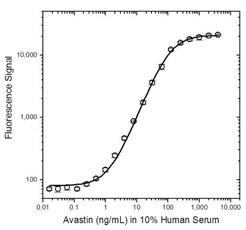 After washing and blocking with PBST+5% BSA, 10% human serum was added spiked with increasing concentrations of Human Anti-Bevacizumab Antibody clone AbD17976_hIgG1 (HCA185). Detection was performed using HRP conjugated ranibizumab at a concentration of 2 µg/ml in HISPEC Assay Diluent (BUF049A) followed by QuantaBlu Fluorogenic Peroxidase Substrate. Fig. 4. Demonstration of the inhibitory property of antibody HCA182. In Figure 4, a microtiter plate was coated over night with Human Recombinant VEGF-A (PHP293) at a concentration of 1 µg/ml. After washing and blocking with PBST+5% BSA, a pre-incubated mixture of bevacizumab (0.3 µg/ml) plus increasing concentrations of Human Anti-Bevacizumab Antibody clone AbD17976 (HCA182) in monovalent Fab format was added. Free bevacizumab, still capable of binding to the VEGF-coated plate, was detected using HRP conjugated Mouse Anti-Human IgG (Fc) CH2 Domain Antibody (MCA647P) and QuantaBlu Fluorogenic Peroxidase Substrate. Data are shown as the mean of three measurements. Fig. 5. 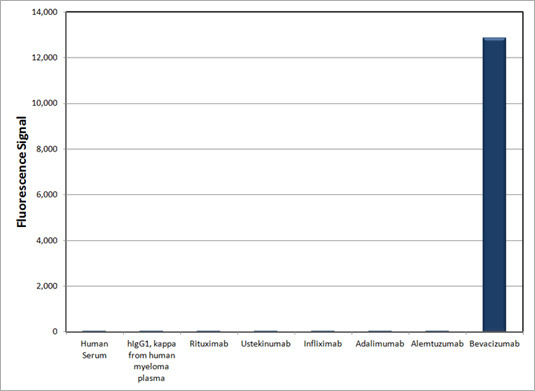 Specificity of Anti-Bevacizumab Antibody HCA182. In Figure 5, antigens were coated at 5 µg/ml on a microtiter plate over night. After washing and blocking with 5% BSA, 20µl of Anti-Bevacizumab Antibody clone AbD17976 (HCA182) from a 2 µg/ml solution in PBST buffer, was added. Detection was performed using HRP conjugated Mouse Anti-Strep-Tag Classic Antibody (MCA2489P), diluted 1:5000 in HISPEC Assay Diluent (BUF049), and QuantaBlu Fluorogenic Peroxidase Substrate.